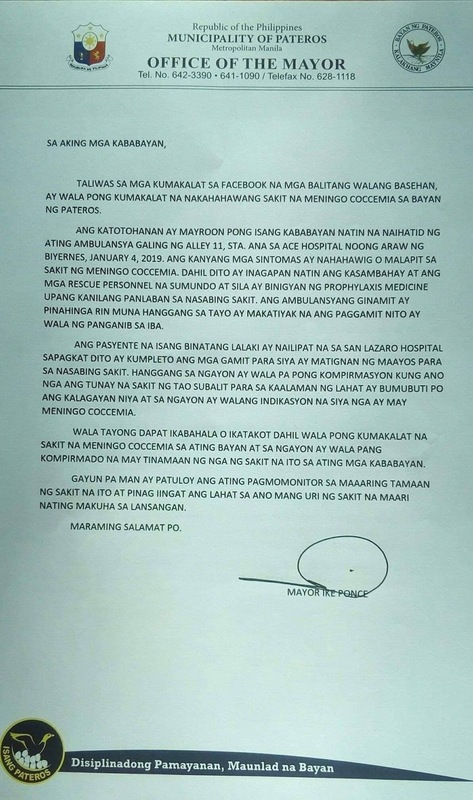 MANILA, Philippines – The Mayor of Pateros has issued a statement today, January 7, to calm the fears of the residents on the alleged meningococcemia disease in the municipality. On Facebook, several netizens from Pateros warned the public about an alleged meningococcemia case. There have also been post of a photo about warning in public school. A particular photo explained that a certain Dr. Raymundo clarified that the suspected meningococcemia case has yet to be confirmed. The statement further added that the suspected patient is in San Lazaro Hospital and those who came in contact with him have been given preventive prophylaxis. It also advised teachers and students who came in contact with the patient suspected with meningococcemia to visit the nearest health center as soon as possible. Meningococcemia is a rare infection characterized by upper respiratory tract infection, fever, skin rash and lesions, eye and ear problems, and possibly a sudden state of extreme physical depression (shock) which may be life-threatening without appropriate medical care. Symptoms usually begins with sudden intense headache, nausea, fever, vomiting, and skin rash. 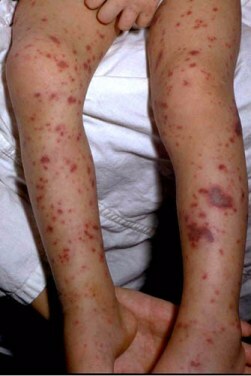 Around half of the total number of cases of meningococcal disease occur in children under 4 years old. Meningococcemia is highly infectious and must be treated immediately. Once admitted in a hospital, the patient must be kept in an isolated room to stop the bacteria from spreading. 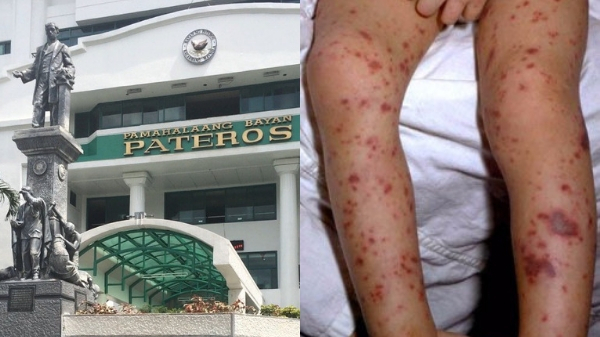 Amidst the fears of the public, Pateros Mayor Miguel "Ike" Ponce has clarified that there are no basis to the claims of a meningococcal infection in their area. Mayor Ponce confirmed that there was a patient from Alley 11, Sta. Ana that was taken by an ambulance to Ace Hospital last January 4 (Friday). He added that the patient had the symptoms of a meningococcemia infection and immediate prophylaxis was given to emergency personnel and others who came in contact with the patient. Last year, an 8-year-old student died after he was infected with meningococcemia. The Manila Health Office confirmed the case and that the student was from Paco Catholic School. Unfortunately, the student died just a day after she was diagnosed with meningococcal disease.